Fantastic Fest returns for its 14th year with more offbeat and brilliant cinema and revealed the first waves of films featured at the upcoming festival. Fantastic Fest will present the World Premiere of the bone-chilling World War II horror-thriller OVERLORD, produced by J.J. Abrams’ Bad Robot, with director Julius Avery and stars Jovan Adepo, Wyatt Russell, Pilou Asbaek, John Magaro and Mathilde Ollivier in attendance. 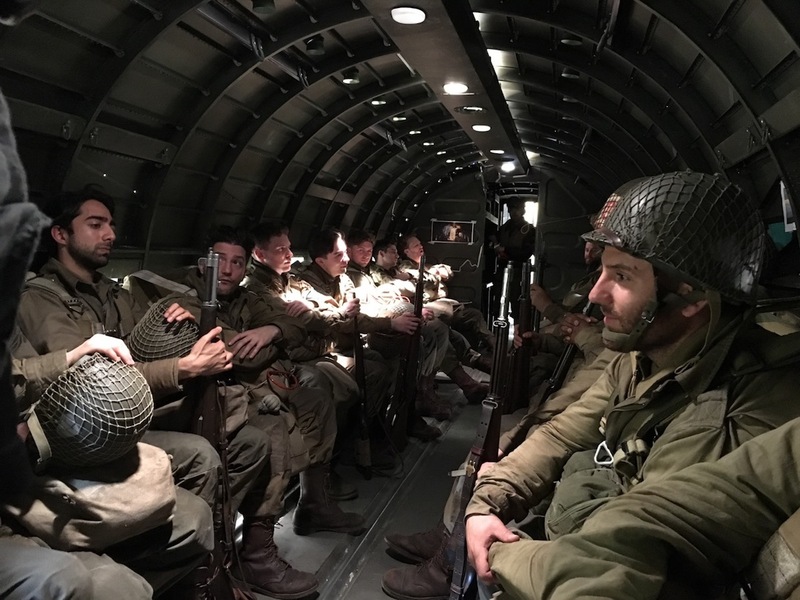 This exhilarating, nerve-shredding ride tells the story of American paratroopers dropped into occupied France on the eve of D-Day who discover a secret Nazi lab carrying out terrifying and bizarre supernatural experiments. Fantastic Fest alumni return to the festival in a dual threat that promises to shock, awe and conquer audiences. First up APOSTLE sees Gareth Evans’ (THE RAID) take on the folk horror genre with Dan Stevens as a mysterious man infiltrating a sinister cult headed by Michael Sheen to rescue his sister with eye-gouging results. Then, Timo Tjahjanto pits Joe Taslim against Iko Uwais (THE RAID) in THE NIGHT COMES FOR US, an action thriller where the body count breaks new records in bone-crunching fights, venomous violence and dynamic destruction! Fantastic Fest’s mission to bring the best of genre continues to flourish with a worldwide group of films headed to Austin for a celebration unlike any other. Leading the pack is returning comedic genius Quentin Dupieux (RUBBER) with his unexpected tale of a police interrogation during a murder investigation over the course of one night in the North American Premiere of KEEP AN EYE OUT. Director Alejandro Fadel’s cerebral Cannes shocker MURDER ME, MONSTER will also have its North American Premiere at the festival. Sensational shot-on-16mm psychotropic horror LUZ will be in Austin for its U.S. Premiere, and the thrilling Swedish independent blockbuster THE UNTHINKABLE will blast the audience with its European take on a nation-under-siege big-budget spectacle at its World Premiere. Other Fantastic Fest highlights include a focus on global female genre filmmakers who are blasting through the silver screen with distinctive and brilliant features. From Ukraine, Marysia Nikitiuk explores the clash between old world values and young love in a visually charged fusion of genres in WHEN THE TREES FALL. Spain’s Sonia Escolano turns up the tension in her mesmerising treatise on religion, faith and belief in HOUSE OF SWEAT AND TEARS. Isabella Eklof brings her Sundance critical hit HOLIDAY to the fest all the way from Denmark. And finally, alumna Amanda Kramer makes an unforgettable mark with her distinctive debut LADYWORLD, a post-apocalyptic, daring probe into the darkest reaches of the teenage female mind. Fantastic Fest turns its eye to South Korea and explores the Korean Quota Quickies, a period in the 1970s which saw filmmaking flourish despite stifling ideological censorship thanks to a quota system which required a strict number of local productions be made for each of the foreign films imported. Although most of these were rushed productions, clever directors used the system to their advantage to sneak strange and daring content past producers, directors and censors. Fantastic Fest is going to present two very rarely seen films from the period: BANGREUMYEON from director Kim Ki-Young, one of Park Chan-Wook’s directing idols, and QUIT YOUR LIFE from director Park Nou-Sik, who provided the literal roadmap for all Korean revenge movies to come.“To be able to highlight a period of Korean cinema that is largely unknown in North America is a brilliant opportunity to not only re-discover what shaped the modern Korean cinema we all know and love, but also a great way to tap into the sheer electric creative force running through the films as shaped by the strict authoritarian environment they were created in,” says FF Creative Director Evrim Ersoy. The festival will also bring the best of modern Korean cinema to the festival including Lee Chang-dong’s critical Cannes hit BURNING. AGFA (the American Genre Film Archive) triumphantly returns to the festival with a trio of restorations all receiving the World Premiere treatment. ‘80s shot-on-video epic BLOOD LAKE is restored from the 1” master tapes and arrives alongside a double bill of I WAS A TEENAGE SERIAL KILLER and MARY JANE’S NOT A VIRGIN ANYMORE, celebrating the punk riot grrrl feminist cinema of Sarah Jacobson, both in brand new 2K preservations. Plus the highly-anticipated World Premiere of MANIAC, restored lovingly from the once-thought-lost 16mm negatives into 4K; with director William Lusting in attendance! A bizarre trio of animation from across the world arrives at the festival to showcase the most daring, dangerous and unique styles. From Japan and the demented mind of Ujicha comes VIOLENCE VOYAGER, a stop-motion cornucopia of mesmerising madness. From Chile, directing duo Cristóbal León and Joaquín Cociña’s breathtaking WOLF HOUSE, featuring perhaps the most inherently sinister and chilling story in any film this year. And finally, from Czech Republic and building on the great Czech puppet animation tradition arrives Aurel Klimt’s delightfully untrue but entertaining story of the first dog in space, LAIKA. The finest vacation from hell ever captured on VHS, rescued from the original 1” master tapes! An absurd all-night interrogation set in a camp ‘70s police station, Quentin Dupieux’s latest opus, KEEP AN EYE OUT, is a celebration of his own brand of quirky, offbeat humor, performed by France’s most refreshing comedic talents. Desperate, aging, Sophie only needs to seduce one more handsome victim — excuse me, date — to become a worry-free Lordess in MADAM YANKELOVA’S FINE LITERATURE CLUB, Israeli director Guilhad Emilio Schenker’s delightfully twisted debut feature. Visual horror masterpiece MURDER ME, MONSTER lures you into the fascinating and opaque underworld of serial murder, supernatural obsession, metaphysical hallucinations, forbidden love — and one nightmarishly gross monster. From the twisted mind of Nicolas Pesce (THE EYES OF MY MOTHER) comes a provocative two-hander chamberpiece — a tense battle of wits and desire between prostitute and trick, predator and prey.